The aquatic vivarium at the Zoological Gardens, Regent’s Park. The Illustrated London News. May 28, 1853, p420. The accompanying Illustrations represent a pair of the water scenes, inclosed between walls of plate glass, of which more than a dozen are now presented to visitors to the Zoological Gardens, in a building which the Society have erected for the novel and ingenious purpose of exhibiting, under natural conditions, an amazingly curious and beautiful division of the animal kingdom which, hitherto but little known to the popular observer, people the endless regions of the lake, the river, and the sea. The exquisite colour and the singular forms of the zoophyte, or plant like animals, which abound upon the English coast, have always attracted more or less attention from the sea-side visitor; and of late years a considerable impulse has been given to the study of their habits and organization by the works of Sir John Dalyell, Professor Forbes, Dr. Johnson, Messrs. Alder and Hancock, Dr. Harvey, and other authors, who have handled the subject with various degrees of minuteness, and with all the aid which the improving talent of our naturalists' draughtsmen now afford to works of this nature. But, in this new undertaking of the Zoological Society, we have not only an illustration of the colour and form of these animals, which no pencil can approach, but a means of observing their habits and economy which far surpasses any opportunity which has been within the reach even of the authors to whom we have referred; and the student may now, without the expense of a journey to the sea, without the use of the dredge, or any other exertion than that of a visit to the Regent’s Park, find himself, in a museum of living nature, where he will find, from to time, all the rarest as well as the most common of the inhabitants of the British seas whose size will admit of the possibility of their existing in the beautiful and capacious glass ponds to which the operations of the Society have been at present limited. For the method which is employed in their management appears to succeed equally well with fish, with crustacea, shells, and zoophytes; numerous examples of all being already well established in their artificial home, which is so admirably equivalent to their requirements that we see no reason why even the gorgeous species which inhabit the most distant corners of the ocean should not be hereafter added to the ever-varying and ever-interesting assemblage of which the Society have now presented the first glimpse to their visitors. The arrangement is simple enough, and the effect of it is altogether charming. The whole length of the ponds is about eighty feet; they occupy two sides of a building of glass and iron, constructed expressly for this purpose at the beginning of 1852. Each pond is six feet in length, and the water is enclosed by walls of plate-glass, each in a single piece. At the bottom of these translucent ponds, rocks, shingle, and sand, with seaweed growing in it, present a model of some nook at the bottom of the sea; and there we have a group of shell-fish, of living shells, of star-fish, of sea-anemones, or of nudibranchs, as the case may be, disporting themselves in precisely the same manner as if they were still uncaptured and free in the depths whence they were borne. The singular mechanism by which these creatures move - by which they seize and devour their prey-the extraordinary changes of colour and form which some of them undergo, render each of these ponds the occupation of a day for a close observer; for, however long he may stand, contemplating the wonders which they inclose - some new action, some movement which he has not seen before, is constantly presented to him. The abundance of specimens which each pond contains, the numerous retreats which the rocks and plants afford to them, and of which a portion of the Inhabitants appear to avail themselves successively, will always prevent the exhaustion of the subject by the visitor; and we foresee in this fact, as well as in the extreme beauty of the objects themselves, a power of attraction which no previous work of the Society has ever yet attained; and we heartily congratulate them upon the success which cannot fail to attend so spirited, so interesting, and so instructive an attempt to carry out the most elevated principles of the science which they are associated to render popular. That the people of this country are not only willing to appreciate such attempts, but anxious to benefit by them, is satisfactorily shown by the crowds who throng the Gardens on all public holidays; and that this feeling has not yet by any means reached its full development is evident from the result of Whit-Monday, when even the best days of 1851 were far exceeded, and the number of visitors amounted, as we are officially informed, to upwards of 22,000. 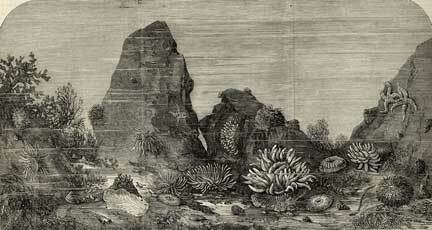 The first Illustration gives an idea, as far as an engraving without colour can, of one of the groups of actinias, or sea anemonies, of which there is now a large collection of species, drawn from different parts of the British coast, and especially remarkable for the excessive brilliance of their colour. These animals, as visitors to the sea-side may have noticed, when disturbed, or when left high and dry by the receding tide close themselves into a smooth hemispherical mass, which presents but little to attract attention. It is only in still water, and in perfect security, that they unfold their myriad tentacles and display the beautifully organised disk which has so much resemblance to a flower, both in form and in the harmonious arrangement of its coloration; and, as their natural localities are either inaccessible under these circumstances, or limited to the rockpools, into which the sea-shore wanderer may look vertically when the tide is out, the true beauty of these lowly, but most exquisite forms of creation, are now for the first time revealed to the public eye; because the plate-glass wall allows us to see the animals much more closely than possible in a rock-pool, under a more favourable effect of light, and in every direction, instead of only from above. The second Engraving represents one of the fresh-water divisions, in which either pond or river-fish appear to live with equal facility. The craw fish, which figure in it, have afforded a delicate test of the capabilities of the plan which has been adopted in this unique and beautiful exhibition; and we observed in another of the divisions which adjoin it, that perch had not only spawned, but that the young fish had been actually hatched, and were, when we made our first visit, swimming about in hundreds among the sheltering branches of the myriophyllum, which forms the vegetable portion of their habitation.